The pump is driven by an AC or DC motor. 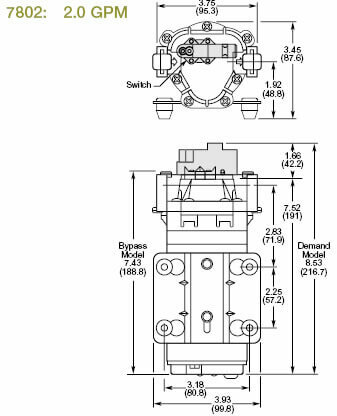 In front, the motor is a valve assembly containing two to five valve pump chambers. Each valve chamber has a diaphragm behind it in the lower pump housing. As the motor shaft turns, an internal cam positioned behind the diaphragms causes the diaphragms to be pushed forward, then back in a continuous sequence creating a suction. As this suction builds, fluid is pulled through the inlet, through the various valve chamber check valves to the outlet. Read more on how to use a water pump and how to choose a transfer pump. Pump Head: 3 chambers, positive displacement diaphragm pump, self priming, capable of being run dry. Demand or Bypass mode available: demand is equipped with pressure switch that will shut down the pump if the pressure goes too high. On bypass pumps, the transfer pump will NOT shut off and the water will recirculate to the inlet side. Pump Head: 5 chambers, positive displacement diaphragm pump, self priming, capable of being run dry. 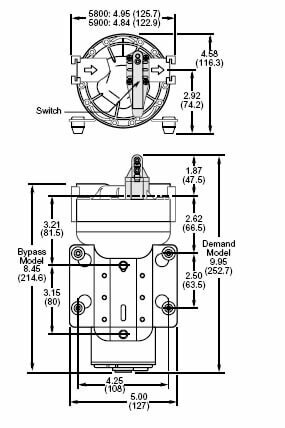 Demand or Bypass mode available: demand is equipped with pressure switch that will shut down the pump if the pressure goes too high (45 PSI, call us for different levels). On bypass pumps, the pump will NOT shut off and the water will recirculate to the inlet side. 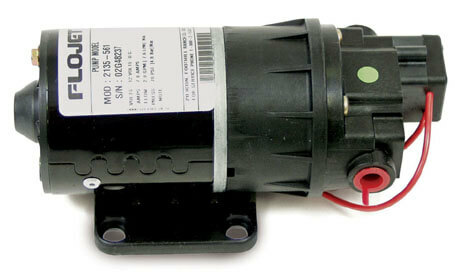 1.00 - 3.8 GPM integrated pump motor units. Powered by 12V DC or 115 V AC Power. Pumps are standard with Santoprene diaphragms and Viton valves for excellent service with a wide variety of sprayable products. 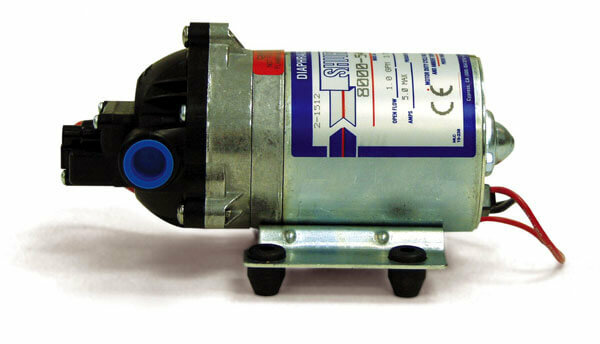 Built in pressure switch automatically starts and stops pump instantaneously. Browse here our large variety of industrial rated COMET Pumps for pressure washers. Built in Italy, most of the models comes with a 5 year warranty.